I am super excited to share this lovely wedding with you today. Carrie is an invitation designer herself for The Event Messenger, but had me do a little wedding map for her welcome guest bags during her wedding. It was held at the T Bar M Resort in the Texas Hill Country. A beautiful backdrop to her rustic ranch wedding. the bride and groom used 3 days to celebrate! With a Thursday night rehearsal dinner, Friday night BBQ, river float, and Saturday wedding all of the guest felt like family by the end of the weekend. Here is a peak inside the welcome bag – you can see my map on the right side. I loved the wood grain sign with their names! Also, a big thanks to Junebug Weddings for featuring this lovely wedding on their blog! I loved being able to participate with a fun engagement session styled by Stephanie Miles of Lavender Joy Weddings and photographed by Ryan Ray. The Idea was by “Bike, Boat or Balloon” and they covered all three! The Bride (Linda) and Groom (Richie) had me pen a little title in gold on a gorgeous leather bound journal that they will keep their travel tales in. It made a little feature in this fun engagement session! This session did not come easy though! 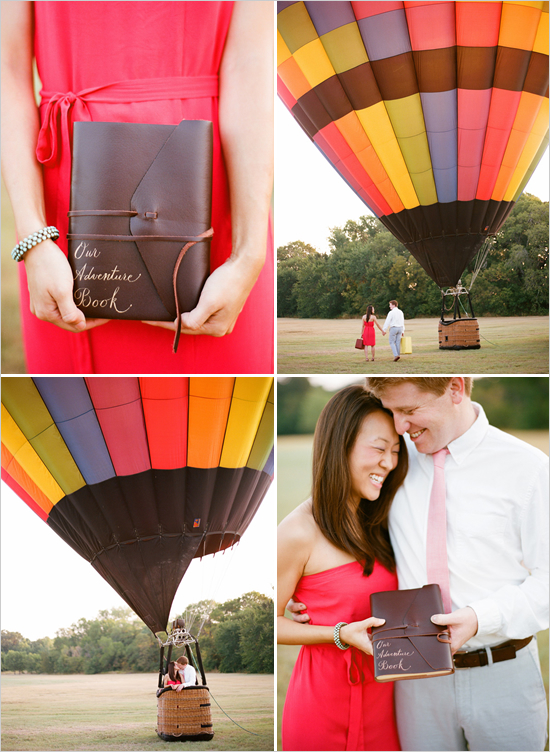 It took 4 different tries to get the hot air balloon pictures because it is so windy in Texas! Thank you all for the persistence because they turned out beautiful. Also, a huge thank you to wedding chicks for featuring this lovely engagement shoot yesterday! I love working with Molly over at Paisley Quill. 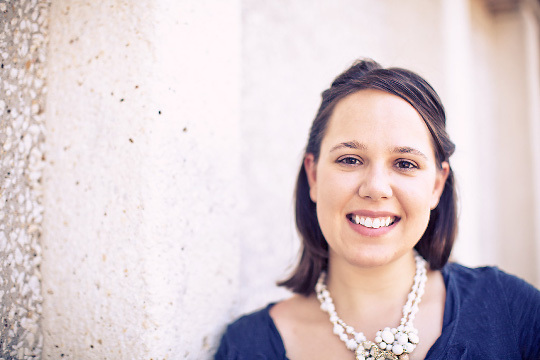 She is a wonderful designer and has such a clear vision (and is super organized!) that it is always super easy working with her, even so many states apart. 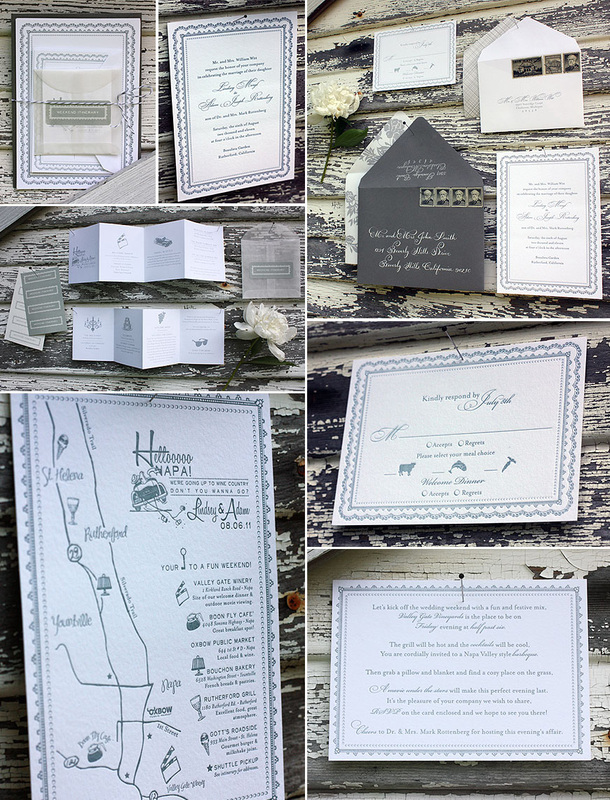 Molly’s client Lindsey had a gorgeous letterpress invitation suite designed for her. I love the framing border and the cute glassine envelope enclosing the fun weekend in Napa fold out itinerary. The whole thing was tied together with bakers twine and enclosed in a lovely grey envelope with my Grace calligraphy in white. 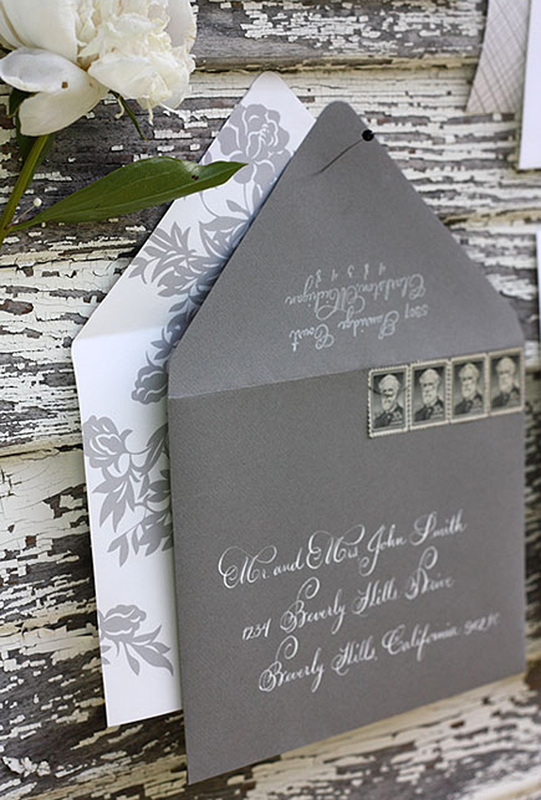 And you can see where we did a custom calligraphy stamp return address in white ink – looks great on the grey! Stunning work Molly. Thanks so much for including me in on this wedding! Photos from Molly’s blog, Thanks for sharing!